Q. Can a water-based finish be applied over an oil-modified finish and vice-versa? Always follow manufacturers' recommendations before applying their finish. For best results when applying a water-based finish over a solvent-based stain, the room temperature must be between 65 and 75 degrees with a relative humidity of between 30 and 50 percent. If the temperature and humidity are not within this range, the finish may have difficulty drying. Dry time is critical. 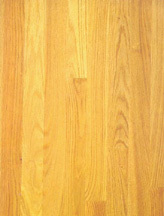 The majority of finish problems are a result of the stain not being fully dry before application of the finish. Remember also that dry time varies with each manufacturer, so it is important to follow manufacturers' instructions. Low humidity and increased airflow will speed up dry time; conversely, higher humidity and decreased airflow will slow down dry time. In the final sanding, the grit used may also affect dry time. The finer the grit, i.e. 120 and 150, the more drying time may be slowed down. This is due to the burnishing effect on the wood. However, if all excess stain is removed, this increased dry time should be minimal. A darker stain or a white stain may take longer to dry. Medium- colored stains dry in less time. It takes from four to 72 hours for stains to dry. (Again, check with manufacturers' recommendations.) There is not a scientific way to determine if the stain is dry, but most contractors use a dry, clean, white cloth to rub the stain, detecting any stain transfer onto the cloth. Also, some manufacturers recommend buffing with a white pad before applying finish. 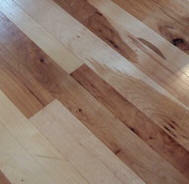 When you start buffing, check the pad bottom frequently for transfer - if it is stained, your floor isn't dry yet. Follow manufacturers' instructions as to coverage rate and uniformity of flow. Application tools normally used are a T-bar with a synthetic applicator, synthetic roller, pad-type synthetic or lambs-wool applicator, and hand brushes made specifically for water-based products. These hand brushes can be made of nylon or of a similar synthetic material. The manufacturer instructions must be followed as to the number of coats for residential and commercial applications. Generally, three to four coats are sufficient for a typical residential application, while commercial applications may require four to five coats, including a sealer.